I’ve been disturbed by some of Vice President Jejomar Binay’s activities the past year or two. His cabinet duty is head of the National Housing Authority, so he has important things to do. But he seems to want to insert himself in other activities, almost as a “counter-balancing” president. It seems that he is working as a member of the opposition to position himself for his presidential run by projecting that he is doing presidential work. It’s been awkward, although President Aquino has handled it diplomatically and recently voiced his trust in Mr. Binay. It also seems to me he is not doing very much to help stem the tide of “power and favor” that underpins corruption. Therefore, he is not doing much to contribute to the rise of the Philippines. Negotiating with the leader of a band of terrorists (his classmate Nur Misuari) who took over Zamboanga. He did this on his own initiative outside the chain of command. Essentially, he put at risk the government’s position of “no negotiations” at a delicate time when dozens of residents were being held hostage. There are other suspect actions by the Vice President, too. An ugly scene involving a confrontation between his son and some private security guards about right of passage late at night; the Vice President backed his son. Handing out donated relief goods with his name on the bags. Continuing to hold Senator Estrada as a feasible vice presidential candidate deep into the pork scandal. Not speaking out clearly against corruption. Rather, he has intimated that the charges are politically based. He should be held to account. I hope journalists in the Philippines are up to the task. Here are some of the questions I believe should be asked, and asked until a specific answer is obtained. Not a political tap dancing answer. If legislators from your party were convicted of plunder or graft, and you were elected president, would you grant pardons to them? Which do you believe is more important, a person’s personal associations and family ties, or skills on the job? Please explain. What capabilities do you believe Manny Pacquiao would bring to the Senate? Regarding China, would you withdraw the Philippine arbitration filing now before the international court? Please elaborate. How should the Philippines best deal with the China conflict? Do you support the enhanced visitation agreement with the United States? Explain. Do you believe management “chain of command” is important for the nation to speak with one voice? Does not having a vice president and president from different political parties go against this idea? You have served Makati and the nation for many years and appear to have wealth far beyond what could be accumulated on government salary. Your children are also well off. Please explain the specific inheritances, investments or activities that produced your family’s wealth. The nation seems to be caught up in a cultural era of “me first” and the nation second, leading to a swarm of plunder and graft charges. It extends all the way to the barangays where vote buying is sponsored and favoritism is rife. What has to happen to change this? Perhaps there are other important matters that should be drawn out, as well. What questions would you suggest be asked? ← Dear Senator Poe. Why your time is now. Good questions, Joe. Although I would leave out the question on Pacquiao or other similar seemingly unqualified candidates because anybody can and has a right to be a candidate for any position and the decision to elect whoever it wants belongs to the voter. Let the debate be settled in the ballot box and not through some method of elimination through pre-qualifications. Pre-qualification is a slippery slope that can lead to ideas like Miriam Santiago proposing a law that only those with college degrees be allowed to run for public office. That is undemocratic, elitist, and nannyistic. It is no way to run a democracy. Let the candidate campaign for votes, let the voters decide, and learn to live with the consequences of their decision. Point taken. hahaha, and disagreed with. I think any job should require specific, published skills and also demonstrated ability, as on the resume. Mr. Binay of all people should be aware of this, and the question is aimed at certifying this. High productivity demands it, and the nation’s government should be highly productive. Voters should be educated on that point. It would then not be necessary to have hard requirements like those suggested by Senator Santiago. The public would not accept people like Manny Pacquiao who can’t even get to the office about a third of the time if they could discern skill from popularity. And they would pick lawmakers of good character and ability who can articulate the issues and point out the solutions. A good observation though but I look at it as a positive action. It shows he is a leader, a friend and ready to serve not only on his specific position. He shows that everybody must help each other and do not just stay within a specific circle or box. Share what you can help instead of a wait and see attitude. What we need at this time is to help each other regardless of whoever and wherever you are. Binay is more than ready to serve not only on his specific position, he happens to interject himself to every opportunity to enhance his ambition to be president to the point of overstepping the position of PNoy in many ways, big and small, showing disloyalty, disregard and disrespect to PNoy. It seems he is always self perpetuating no matter whoever and whatever the situation is. Is this the kind of president for the Philippines to be had? If he is trampling the position and personality of PNoy, then when he becomes president, if ever, the more he will trample the common tao, showing no loyalty, respect and regard to their well being. His being friendly and helpful is for the sake of the voters to elect him, a chameleon in so many forms. A very healthy, positive point of view, Edward. Thanks. A bit too ideal I think. Companies hire people based on skill, experience, education, etc.Heck, when I hire a maid, I ask her about her experience, can she cook,etc. The people who wish to run for Presidency are free to study. I don’t want an idiot or a person with questionable morality to lead my country to oblivion. This somehow reminded me of Lito Lapid. Paging Joey Salgado, Binay’s microphone. Anybody think Binay is up for a debate with other candidates? Or will he avoid it like the plague, like Erap and Fernando Poe? Avoid. Senator Poe, on the other hand, would take up such a challenge. 1. Of course, I am entitled to my own KKK, am I not? 2. Preferably skills on the job, but heck, even PNoy was elected on account of his family ties to Cory and Ninoy. 3. Manny Pacquiao? Well, we’ll see. He might surprise you like PNoy has been surprising you. 4. Pass. But I love Chinese noodles and siopao. 6. I support that. On the balance I would probably seek to have a similar agreement with the Chinese hehehe. 7. We may belong to different parties but our family ties are way deep and enduring. I might just get PNoy’s endorsement, huh. 8. I fought Marcos, that is all that matters. If it is mystery to you how I became I billionaire, well even my friend Rene Saguisag doesn’t mind, and who would question Rene’s integrity? 9. What has to happen to change all these? I must become President first. Me, a PR agent, Joeam? No. Or do you happen to be Joey Salgado in disguise? 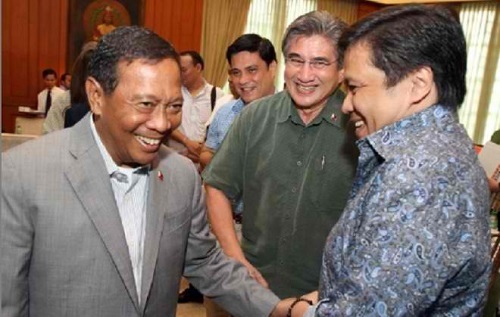 Why, do you find it flattering to Binay? Read again. Nope, it’s not flattering at all to BInay but I can see his PR people replying in the way you presented it, especially # 7,8 & 9. Ahhh, yes. Too bad I am so obtuse and stubborn. With his very high trust ratings & the millions of gullible voters that he & the Estradas as sure to muster, VP Binay can afford to ignore these questions. Yes, that is true. He will not even need to put up a platform of anything but sweet generalities. If he gets popular leaders in each major vote-rich region speaking out loudly for him (say Garcia of Cebu, Arroyo of Pampanga, Romualdez of Leyte, Estrada, Revilla, Enrile . . . etc. ), he will command the polls. Sorry, not a chance he’d ever answer any of those questions. However. There is one question that will be answered without a single word being muttered. If “elected” president, when will you turn the government into a Dictatorship? Just wait, watch and see. If he says yes, then VP BINAY at his limited age has LEARNED and MATURED, ready for CONTINUATION OF LOGICALLY BLOCKING CORRUPTIONS AND HE WILL SUPPORT for his grandchildren’s future. Everyone has a chance to repent and participate in good deeds. That’s true, and as I penned elsewhere, if Mr. Binay WERE elected, I’d call him Mr. President and give him the respect he deserves for winning the election. Of course, as I criticize President Aquino for not backing FOI as a mainstream element in the fight against corruption, I’d criticize the new Mr. President’s acts if I thought they were wrong. I like the optimism you express. It has some balance to it rather than being black and white. Its a different perspective than those who are either for or against. Period. Repent? Maybe. But UNA was a creation of Binay, Enrile and Estrada. Are we ready to accept a Binay presidency with a pardoned Enrile and Jinggoy sitting as, for example, example lang, Defense Secretary and DILG secretary respectively? If the answer is ‘YES’, then let’s hope for a Binay repentance then, hoping also that he will repent having Enrile and Estrada as his political buddies, then we endorse him for president in 2016. IF he wins, and IF he ever betrays this country for China. I would buy a sniper rifle and personally execute this would be traitor. There, there, JM. No physical intimations, please. I do sympathize with your distaste for those who would betray the nation and cozy up to eco-marauders, racists and thieves, especially if it is for private gain. I guess THAT is the thing that Mr. Binay would have to convince me of. That he really is FOR the Philippines. I mean, Senator Pacquiao? Vice President Estrada? Senator Binay? And another Senator Binay? And a third Senator Binay? Give me a break! How about working on competence in government. You ask sharp questions. Good ones. I’ll have to do an article that talks about what Mr. Binay needs to do to win the middle class. I was heading down that track but never got there. Granting pardons would alienate the middle class, so he would have to provide point blank assurance that he would respect the law’s judgment and not pardon people except for specific cause. Re your third question: If he could demonstrate how he would provide free education and stop the incessant exam and uniform and other fees, he would get me to listen, for sure. VP J. Binay’s inherent attitude of being an unwanted gatecrasher in an occasion which disrupted the program. Last year Sen. Grace Poe was invited to a gathering of journalists in a venue at Tagaytay and without any valid reason VP J. Binay invited himself, barged in as an uninvited guests to the chagrin of the event organizers who with due respect welcomed him with respect befitting as a vice president of the country but the protocol of a vice president coming to such occasion was not followed. The ultimate goal of his unscheduled visits to the gatherings of the journalist guild, a personal photo ops with Sen. Grace Poe? To show to the public that he is a good personal friend of Sen. Grace Poe which now he starts to discredit in public as an undesirable alien? I remember that. Next he’ll attack Mary Jane for not being properly Filipino, getting jailed like that . . .